Many of you have probably traveled outside of Canada or the United States, and seen what it’s like in a foreign country – at least for a week or two, or maybe a bit longer. While those short term trips give you a glimpse of what life is like outside of North America, you know that it’s only a couple more weeks before you head back to the comforts of home. But what would you do if you were called on to live here in Asia for the next couple of years? With that in mind, I have jotted down a few thoughts to go with some pictures from here in Hong Kong to give you another insight into what it’s like living overseas. Whenever we’re back in North America, we’re used to driving just about wherever we want to go – but here in Hong Kong it’s a different story. As we have said in previous blogs, Hong Kong has a great public transportation system – so most people don’t own a vehicle (the density of cars is among the highest in the world, with 530 registered vehicles per km²). With gasoline at $2.18 US/litre ($8.25/US gallon), and parking spaces at a premium, it’s more practical for most people to use a variety of public transportation (mostly buses, trains and subways) to get around. However, if you do decide to drive a vehicle here in Hong Kong, you had better make sure you know where you’re going. The roads do not have large shoulders to pull off and park – even just for a minute. Even if you’re aided by a GPS device, you should be aware of two unwritten rules of the road here: (1) the bigger the vehicle, the more right of way you have; (2) fight to be first – fear to be last. The first rule is pretty self-explanatory, while the second one is more of an attitude by some of the drivers (especially taxis). 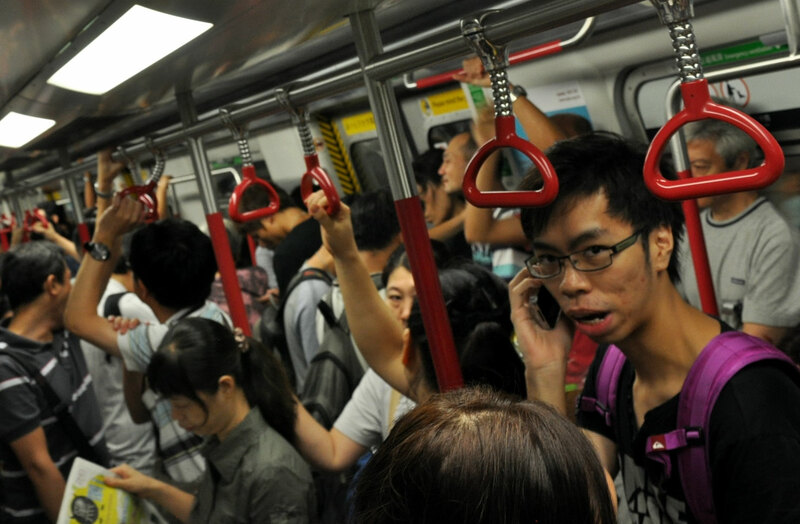 Public transport is convenient, but getting around Hong Kong still requires a lot of walking. For us, we have a 5-minute walk from the front of our apartment complex to the nearest bus stop – that’s just the first leg of anywhere we want to go. In North America, it was a 10-second walk to the car in the driveway, and then a 30-second walk from the car to the mall – depending on how close a parking space we could find! So if you plan on moving to (or even visiting) Hong Kong, you’ll need a good pair of walking shoes, and make sure you’re in good enough shape to walk from where public transport lets you off to your eventual destination. One major aspect that everyone deals with sooner or later here is the crowds. Most North Americans are used to having their own ‘personal space’ when they’re out and about, but here in Hong Kong you have to find a way to contend with the crush of people. 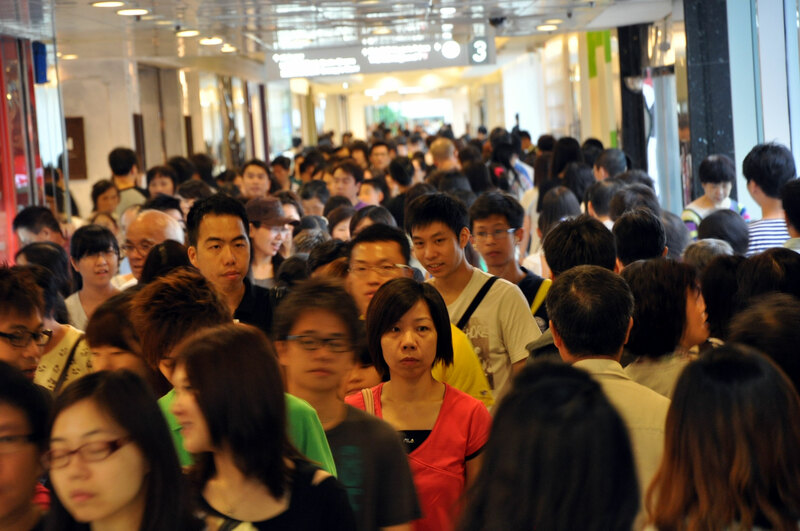 Whether you’re just walking down the sidewalk, shopping in a store, strolling through the mall or traveling on any of Hong Kong’s mass transit systems (bus, subway or train) – sooner or later you’ll find yourself trying to work your way through the mass of people. As we mentioned before, people have their own way of walking, and the challenge is to safely and quickly work your way through the crowd – something that will most definitely test your patience. The reality is that getting around Hong Kong is quite different than most cities in North America. It is easy (and common) for expats to become exasperated with the way locals move from place to place. Being constantly pushed out of one’s comfort zone can sometimes drive even the most patient person to the point of frustration. Traveling on the KCR (train) in Hong Kong. For instance, you will have to face the ‘fight to be first – fear to be last’ attitude when traveling on Hong Kong’s train & subway system. There you will encounter people trying to get to the front of the line (one way or the other, even if that means cutting in front of you) so they can be the first one onto the subway car (to find one of the few empty seats). Or they will push to be at the front of the door when it opens to exit (so they can be the first one to get to the nearest escalator), which will allow them to be the first person in line for the next train or bus! The sooner you realize, like Dorothy in the Wizard of Oz, that you’re not in Kansas anymore, you can start learning and adjusting to the local customs and habits. The challenge (as I see it) in getting around Hong Kong is not so much being prepared to do more walking, or learning how to negotiate the crowds to get on the bus or train, but it’s to be willing to adapt to a different mindset and a different way of life. We have lived here in Asia since 1989, and while I would like to think I have adapted to the Hong Kong lifestyle, there are still days when my annoyance with cultural differences reminds me of my egocentric nature. Learning to exhibit grace under pressure is something we all need to practice – whether it be as we are jostled in getting on the subway here in Hong Kong, or when you are cut off by someone in traffic on your way home today! In her role as Bible class teacher, Debbie has 90 seventh graders to work with – all with their own personalities and unique characteristics! PRAY that Debbie would take the time to listen to the Holy Spirit’s prompting, and be given wisdom in preparing for classes, as well as in those “teachable moments” with her students. Thank you for praying for our daughter Janelle. We are thankful that she was able to find an apartment in the LA area to rent with a college friend, and they were able to move in at the end of August. Continue to PRAY with us that she would be able to find full-time work related to her area of studies – exercise science. We PRAISE God that Joel’s application for a new China visa was approved without any delays. Joel will be traveling to Guangxi this coming week (September 16-22) to meet with church leaders in two key cities. PRAY for wisdom and discernment as he follows up about recent leadership training sessions and has the opportunity to share with them on a deeper more personal level.